Maybe your company employs a team of brokers to secure transportation after filling out order forms. Or perhaps your company staffs one or more dispatchers to find drivers and trucks to haul those orders to customers. The truck drivers then have to write down each transaction on a piece of paper, after which the accounting team has to manually enter the transactions into a ledger and mail out bills. After that, you have to wait a few weeks to receive confirmation that the customers received the correct invoices and paid. And finally, accounting has to manually place the bills in a filing cabinet. Picture how long that whole process takes. Now, imagine if you had a system that could do all of that for you with fewer errors and in less time. If you want to cut down on manual labor and improve efficiency across your company, a transportation management system (TMS) solution is what you need. Whether you are a shipper, carrier or customer, every step in the supply chain matters. If the job is not done efficiently or on-time, it could mean lost revenue. A high-performing, scalable TMS solution with integration capabilities will ensure that your business can manage every aspect of the supply chain. Whether it’s dispatch, finance, HR, safety, maintenance or IT, a TMS solution can optimize operations and efficiency across the board. Dispatching: Quickly evaluate the status of the fleet and analyze load specific data. Improve routing to avoid inefficient directions and ensure deadlines are met. Reduce planning time, operating costs and empty mileage. Finance: Accurately file order information. Track loadouts and carrier charges at every stop. HR: Customize new driver applications. Gauge driver qualifications. Simplify the work that drivers have to do while on the road, which will boost driver retention rates. Safety: Collect data about break times and ensure that drivers are taking proper breaks at optimal times. Track vehicles and, in case of emergency, send assistance. Reduce accidents by avoiding unfamiliar routes and high traffic areas. Maintenance: Analyze fault code data to see when something needs to be fixed before it breaks. Schedule regular maintenance checks by monitoring mileage, engine run time and time between checkups. IT: Scale software according to needs. Integrate a TMS with an ERP or warehouse management software (WMS) solution to significantly reduce manual data entry (and the chance of error). Automate data collection throughout all levels of the supply chain to improve efficiency. Company managers often question why they need to upgrade to a TMS system when their current business operations work. There are a number of reasons for implementing a TMS systems in today’s transportation industry that just make good business sense. The technology that is available to shippers, carriers and customers allows for full transparency across the board, which leads to enhanced customer satisfaction. A TMS platform works from order entry through settlement. The resulting reliability, on-time delivery and superior customer care increases the likelihood of repeat business and, thus, increases revenue. TMS solutions provide accurate data that improve business intelligence to make informed business decisions that increase efficiency and improve margins for shippers, carriers and customers. 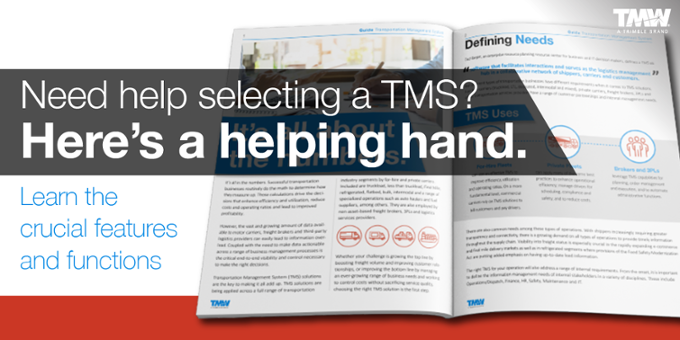 Finding the right TMS solution that fits your business is not an easy process. There’s a lot of planning and employee training that must take place to guarantee a smooth transition to the new technology. But, for those who take the time to implement a solution, the investment is ultimately well worth it. Read TMW’s white paper, “Finding a Total Solution: What to Look for in a TMS” for more information on the benefits of implementing a TMS system and how it will boost work efficiency and how it can improve your company’s bottom line.